London, 1873. The Royal Academy of Space Exploration has announced its intention to launch a mission to Mars by year's end. In its quest to claim, fully explore and map the great red planet, the Academy is holding recruitment competitions for various positions on the crew. A position central to the crew's mission, the Astronautical Engineer must be resourceful and efficient in his construction of various mechanisms and ship maintenance. Players represent engineers and tinkerers from all over the Empire who have come to compete for this prodigious opportunity. 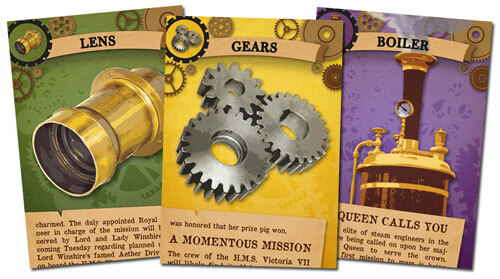 Starting the game with only 30 cogs (currency), players will utilize unique mechanics that emphasize timing to collect sets of components and build steampunk mechanisms aimed at earning even more cogs. At the end of the competition, the engineer with the most cogs will earn his place as Astronautical Engineer on the crew of the H.M.S. Victoria VII. 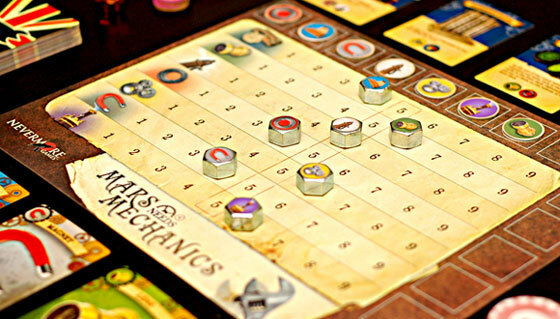 A play through of Mars Needs Mechanics with the designer, Ben Rosset. Instructional. 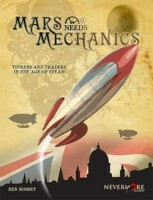 Add a Review for "Mars Needs Mechanics"